Sometimes compared to Alpe d'Huez. Similar gradient (but Beille is a bit longer and 100 metres more climbing). The climb is relentless and very steep in places. A Tour de France regular and often the winner goes onto be the overall victor. Topping out at a height of 1590 metres the Beille is an important Ski resort for the Pyrenees mainly dedicated to cross country skiing. One of our favourite routes to Plateau de Beille from Rhino Velo. Heading south through Foix and following the Ariege river on your right hand side. Before arriving in Tarascon we take a left turning at Bompass onto the Routes des Corniche one of the most beautiful roads in the Pyrenees. Climbing up 10km to just over 900 metres before turning right and down a sinuous descent into Les Cabannes and the bottom of Plateau de Beille. 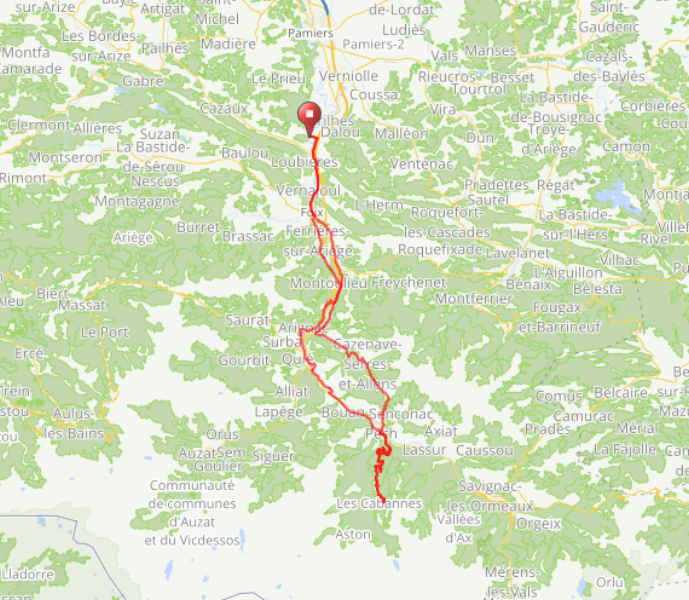 Once the climb has been tackled and energy has been restored with a stop at one of the many cafe's in Les Cabannes we head back on a mainly downhill route via Tarascon and through Foix along the opposite side of the river.